Berries, like boysenberries, blackberries, raspberries, strawberries, blueberries, and blackberries, are packed with antioxidants that are known to harvest many health benefits. 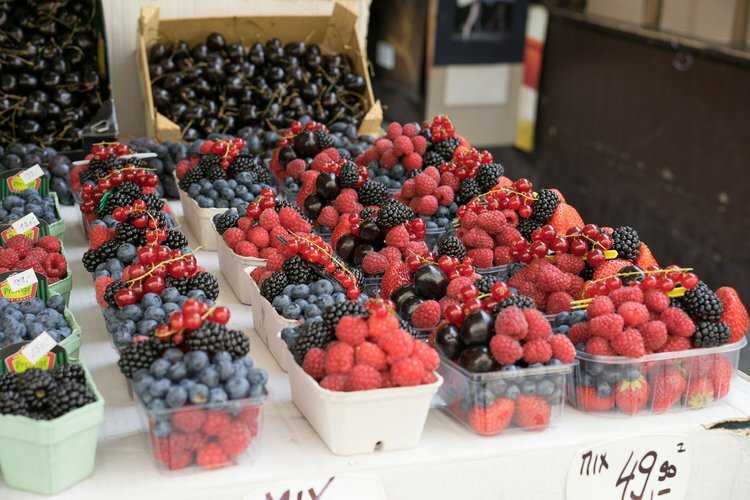 Berries, like boysenberries, blackberries, raspberries, strawberries, blueberries, and blackberries, are packed with antioxidants that are known to harvest many health benefits. Loaded with nutritional benefits, like vitamins and minerals, berries are known as some of the world’s best superfoods. Berries are an excellent snack to munch on because they are low in calories with a high amount of fiber. Most berries contain at least 85% water. The fiber content in berries can improve digestive health and alleviate constipation. The fiber helps the body drive out biological wastes, while maintaining a healthy blood sugar level. The fiber content in berries gives it a lower glycemic index value than other foods. The glycemic index (GI) scores food and drinks based on the potential blood sugar increase that the food can induce. It is beneficial to eat foods low in GI because these foods are less likely to cause any spurt in the blood sugar. Foods with high GI values, such as white rice and white bread, will break down easily and potentially be dangerous to individuals with diabetes. The sugar from berries is slowly absorbed into the bloodstream, which prevents sugar crashes, sugar cravings, and mood swings. Some of the most potent antioxidants in berries includes anthocyanins, quercetin, and vitamin C. Anthocyanins give berries their dark red color. They can help the body reduce inflammation, as well as prevent and manage arthritis. Anthocyanins work together with quercetin to help slow age-related memory loss. Quercetin can also decrease the inflammatory effects of chemicals in the fluid of the joints in individuals with inflammatory conditions. Manganese is necessary for energy production and antioxidant defense. For example, some enzymes that defuse cancer-causing compounds require manganese. Berries are rich in the mineral manganese. They also contain vitamin C, which is a powerful natural water-soluble antioxidant that helps the body develop resistance to infectious compounds. For individuals with high blood pressure, berries can help maintain a healthy blood pressure. Berries have a high potassium to sodium ratio, which can lower the systolic blood pressure. Dietary fiber can also help ‘scrape’ cholesterol out of the arteries and blood vessels, allowing for smoother blood flow. An improved blood pressure can help enhance heart health. A study published by the American Society for Nutrition suggested that individuals who consumed 4069 milligrams of potassium per day had a 49% lower risk of death from ischemic heart disease, compared with those who consumed less potassium (approximately 1000 mg per day). The potassium in berries may also improve brain function. Several components of berries, such as potassium, folate, and assorted antioxidants are known to provide neurological benefits. Folate has been known to reduce the rate of Alzheimer’s disease and decline in brain function. Potassium has been linked to increasing blood flow to the brain; it enhances the thinking ability, concentration, and brain activity. Thus, adding some berries to one’s morning breakfast cereal can help one receive an antioxidant boost. Not only are berries are great for boosting brain function, improving the quality of the heart, and leveling blood sugar levels, but they also have incredible antioxidant power to fight and even prevent various types of cancers. Chirumbolo, S. (2010). The role of quercetin, flavonols and flavones in modulating inflammatory cell function. Inflammation & Allergy-Drug Targets (Formerly Current Drug Targets-Inflammation & Allergy), 9(4), 263-285. Davidson, J., & Usman, M. (2013). Health Benefits of Oranges For Cooking and Health. JD-Biz Corp Publishing. de Carvalho, É. B., Vitolo, M. R., Gama, C. M., Lopez, F. A., Taddei, J. A. C., & de Morais, M. B. (2006). Fiber intake, constipation, and overweight among adolescents living in Sao Paulo City. Nutrition, 22(7), 744-749. Shaik, Y. B., Castellani, M. L., Perrella, A., Conti, F., Salini, V., Tete, S., ... & Cerulli, G. (2005). Role of quercetin (a natural herbal compound) in allergy and inflammation. Journal of biological regulators and homeostatic agents, 20(3-4), 47-52. Paredes-López, O., Cervantes-Ceja, M. L., Vigna-Pérez, M., & Hernández-Pérez, T. (2010). Berries: improving human health and healthy aging, and promoting quality life—a review. Plant foods for human nutrition, 65(3), 299-308. Beattie, J., Crozier, A., & Duthie, G. G. (2005). Potential health benefits of berries. Current Nutrition & Food Science, 1(1), 71-86. Vattem, D. A., Ghaedian, R., & Shetty, K. (2005). Enhancing health benefits of berries through phenolic antioxidant enrichment: focus on cranberry. Asia Pacific journal of clinical nutrition, 14(2), 120. Schreckinger, M. E., Lotton, J., Lila, M. A., & de Mejia, E. G. (2010). Berries from South America: a comprehensive review on chemistry, health potential, and commercialization. Journal of medicinal food, 13(2), 233-246. Battino, M., Beekwilder, J., Denoyes-Rothan, B., Laimer, M., McDougall, G. J., & Mezzetti, B. (2009). Bioactive compounds in berries relevant to human health. Nutrition Reviews, 67(suppl 1), S145-S150.